In addition to training and e-Learning courses, UNITAR provides the opportunity to gain knowledge through post-graduate courses. UNITAR partners with academic institutions such as the Open University of Catalonia, the Graduate Institute of International and Development Studies and the University of Copenhagen to offer diplomas and certificates in areas such as peacekeeping, development policies and geo-information in disaster situations. The Master in Multilateral Diplomacy is jointly organized by the Moscow State Institute of International Relations (MGIMO) and the United Nations Institute for Training and Research (UNITAR). The programme’s study plan consists of a block of compulsory and elective courses, allowing each student to form an individual schedule, corresponding to his professional interests and personal inclinations. The basic disciplines that form the programme are megatrends and global problems, historical background of Russia's foreign policy, analysis of international situations, global governance and international institutions, global security and contemporary international conflicts; modern network diplomacy and practical modules with invited UNITAR experts on the UN system, conference diplomacy, UN protocol and etiquette etc. During the final semester of the programme, students will have an opportunity to conduct an on-the-job training in one of UNITAR's international partner organizations. Finally, graduates of the Multilateral Diplomacy programme will have a high level of proficiency in foreign languages, professional knowledge in the field of international relations, diplomacy and negotiation process, as well as skills in intercultural and business communication. Today project management is a fundamental component of management culture, enabling managers to perform work efficiently. Key resources of new formation leaders are knowledge of management laws, understanding of government bodies’ functions and developed leadership qualities. The Master in Project Management is jointly organized by the Moscow State Institute of International Relations (MGIMO) and the United Nations Institute for Training and Research (UNITAR). The aim of the Programme is to train international specialists for civil services and commercial spheres who will be planning, implementing, supporting, monitoring and controlling international projects in various fields of activity. One of the main features of the programme is the active participation of UNITAR experts aimed at developing negotiation skills and leadership qualities of the students. Finally, educational modules of the Master are completed with the practical UNITAR’s module, where participants will receive a unique opportunity to get acquainted with the world leading diplomats and the process of decision-making and implement all knowledge gained in one of UNITAR partner organization as a part of the on-the-job training. In an increasingly interconnected, globalized and complex world, where the importance of multilateral dialogue and cooperation is ever growing, the demand for training and capacity development in the field of international affairs and diplomacy is constantly rising. In this regard, the establishment of this innovative on-line Master in International Affairs and Diplomatic Practice between the United Nations Institute for Training and Research (UNITAR) and the Open University of Catalonia (UOC) holds great significance. Built on both institutions’ expertise, this Master and its related qualifications aims to strengthen performance and practice of diplomacy in multilateral settings and to foster understanding and knowledge of international affairs and regional studies. The Master’s Programme and the two Post-Graduate Certificates are designed for diplomats as well as staff of governmental and non-governmental organizations, graduate students, young researchers and other academics interested in gaining a thorough understanding of international affairs and diplomacy and acquiring soft skills to thrive in their careers. By the end of the programme, participants will gain critical understanding of key issues and concepts in world affairs and practical knowledge they could leverage in their professional project. They will also be able to perform in both bilateral and multilateral working environments with increased confidence and advance their careers in joining a broad group of alumni across the world. The Master’s Degree in United Nations and the Art of Peace focuses on the study of 70 years of the UN action in the fields of peace-making, peacekeeping and peacebuilding. It allows students to become more knowledgeable on the matter as well as to profit directly from the insights of the experts from the United Nations and academia in order to better assess and apprehend peace initiatives and understand the processes of preserving, defending and promoting peace in all their complexity. Built on the experiences and expertise developed by UNITAR (United Nations Institute for Training and Research), WFUNA (World Federation of United Nations Associations) and the Graduate Institute of Peace Studies at Kyung Hee University, this degree explores the different facets of the actions undertaken in the international field to promote, preserve and defend peace. The United Nations being at the centre of this process for the last 70 years, the degree uses the UN both as a study subject as well as a source of expertise. The programme is mainly designed for students of social sciences that wish to pursue their post-graduate studies focusing on the promotion of peace possibly in view of securing an internship or a job in a relevant international or non-governmental organization. Violent conflicts and wars have been recurrent throughout history. From increased insecurity, to economic instability and the collapse of law and order, the effects of conflict at the local, national, regional and international levels are devastating. 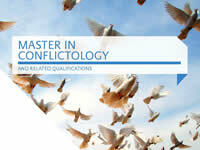 Built on the expertise of UNITAR and the Univeristat Oberta de Catalunya (UOC), the Master in Conflict, Peace and Security presents a unique opportunity to professionals working within the framework of international and regional organizations, as well as governmental and non-governmental institutions to examine conflicts in all their dimensions and to explore innovative approaches for their management, resolution and transformation, through a network of world-leading academics and experts. The programme aims at professionals (civilian, military and police) working in conflict-prone environments, within the framework of international and regional organizations (United Nations, African Union, European Union – among others), as well as governmental and non-governmental organizations. By choosing the international Master’s Degree in Conflict, Peace and Security, students gain access to a broad group of alumni spread across the world. Becoming a part of this community will be a valuable asset for life. Elections have become a major factor in the stabilization and democratization of emerging democracies and post-conflict countries. However, the risk of a relapse into war and violence is considerable. Elections in these countries are a tightrope walk between war and peace, stability and instability. 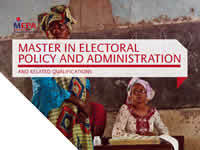 Built on the expertise of UNITAR, the Scuola Superiore Sant’Anna and the International Institute for Democracy and Electoral Assistance (International IDEA), the Master in Electoral Policy and Administration (MEPA) provides advanced knowledge of electoral processes for current and aspiring elections professionals. The Master targets mid/upper level professionals who want to acquire the specific knowledge and skills to work as election administrators and/or to work as part of Election Management Bodies (EMBs). The Master focuses on the development of “electoral professionals”, that is, professionals who share a common set of norms, behavioural standards, and qualifications to assume specific roles and responsibilities in the area of electoral policy and administration. Responding to a global, structural demand for qualified electoral professionals, the Master offers a systematic and comprehensive approach to the professional development of those enrolled and places particular emphasis on the importance of advancing equal career opportunities for men and women. Complex man-made crises, conflicts, violence and unrest have become a global concern for the international community. Designing interventions in these extremely volatile contexts requires specific knowledge and skills, to be able to minimize negative impact and maximize opportunities for positive and sustainable changes. Built on the expertise of UNITAR and Oxford Brookes University (OBU), the Master in Humanitarian Action and Peacebuilding explores the interactions between these two fields, by linking theory with practice and applied knowledge. The programme involves online lectures, discussions with key practitioners, experience sharing, and critical reflections – all within the framework of an action research-based approach. The aim of the programme is to enhance reflective practices combining the art of conflict sensitive approaches to humanitarian and peacebuilding programming with the appreciation of the wider context in which these interventions unfold. The programme is designed for practitioners working in the fields of humanitarian action and peacebuilding, though it is also open to personnel working in the related fields (such as military and police officers deployed or about to be deployed in field operations, civil servants – including diplomats – in charge of humanitarian affairs, academics teaching humanitarian affairs, journalists, etc.) 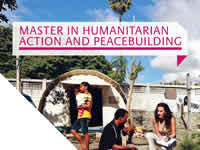 seeking to develop a more holistic understanding of critical issues related to humanitarian action and peacebuilding. Finally, the programme targets practitioners working in other professional sectors, interested in exploring opportunities in the fields of humanitarian action and peacebuilding. 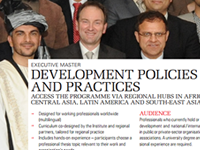 The Executive Master's Degree in Development Policies and Practices edition 2014-2015 is being offered to civil servants from the Afghan Ministry of Finance.The programme lasts for 12 consecutive months and ends in the conferral of a Master’s degree for successful candidates that fulfill all requirements. UNITAR’s Decentralized Cooperation Programme and the Graduate Institute of International and Development Studies are jointly implementing the Executive Master in Development Policies and Practices. The programme aims to strengthen the knowledge, skills, and capacities of ministerial officials on the themes of effective governance and sustainable development. The Master’s curriculum is implemented by professors from the Graduate Institute of International and Development Studies and by UNITAR trainers. The University of Copenhagen and UNOSAT have agreed on a collaboration model bringing UNOSAT training in the University environment to new heights. While still participating in courses in Universities in the United Sates, Switzerland, and Sweden, UNOSAT now engages in Master degree training. 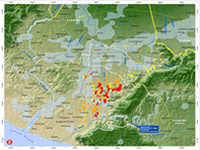 As of this year the Master of Disaster Management offers an intensive course in Geo Information in Disaster Situations based on a successful formula combining formal training and experience based knowledge transfer directly from UNOSAT experts and analysts. This successful methodology has already been used in several capacity development projects run by UNOSAT for UN member states and a few international organizations. The Geospatial Information course, offered within the curriculum of the Master of Disaster Management at Copenhagen University, will be open only to a limited number of applicants among those studying each year for the Master degree and will earn each student 6 ECTS credits.